Nic worked as a caretaker for a mining camp in Tanzania during the mining season. He enjoyed the experience. 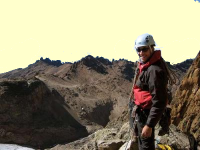 After that he went up Kilimanjaro as well as did rock climbing on Mt Kenya. 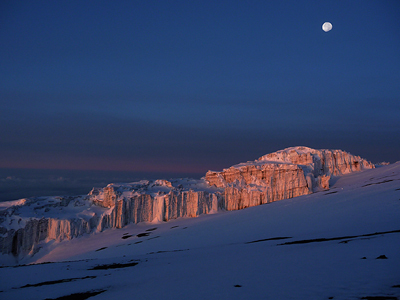 I first did Kilimanjaro. I used a company called African Scenic Safaris. It is a husband (TZ) and wife (Australian) team in Moshi. They were extremely helpful and their service was great. Nothing was any trouble and Amanda even obtained the name of a dentist in Arusha because I had sore teeth. The dentist was great and highly recommended (Tanja Todorova). On the mountain the guide and the porters worked as expected and no real dramas of any issues. Interestingly I thought that the whole set up of Tanzania was very primitive and backwards with regards to portering and guiding. Reminded me of the European Alps around the 1800s when mountaineering was just starting. Peasants who knew the trails below the snowline were used as porters and guides. Above the snowline the porters and the guides depended on the knowledge of their clients to keep them safe. There was a general poor understanding of what it was to be in the mountains, how to carry loads, how to look after clients, how to acclimatise, first aid issues and so on. It was a series of "this is how we did it last year and that is how we are doing it this year". There was absolutely no attempt to try and improve. I found it incomprehensible that they were carrying loads on their heads. In the savannah loads on the head may be fine however on a mountain where you occasionally had to take high steps, use your hands for gripping holds and climb up, it was downright dangerous. The idea of doing research and finding out how the best porters in the world (Nepalese Sherpas) are doing it was not even worthwhile discussing. No ideas about the effect of repeated exposure of high altitude sun on the skin or the eyes. I gave my guide a set of sunglasses which he did not bother with. Interestingly he ended up with incipient snow blindness a couple of days later because there was an unforeseen snowstorm and his eyes deteriorated. Interestingly the load limit is 18kg. Sherpas are smaller than African and yet their load limit is 30kg. I used a company called African Climbing Safaris run by Chris Mbongo. He was great and similar to the Moshi couple, nothing would faze him and he tried very hard. Well done. 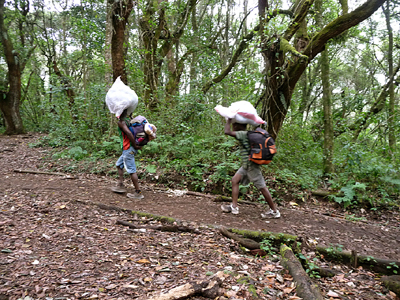 The porters and the guide on Kenya carried everything on their back. Interestingly the trails were such that carrying on their head would have been fine as there was no step up climbing, no handhold climbing. Just a different climbing culture. I was concerned about the rock climbing guide. He is literally holding my life in his hands. His name was Kenneth Kandl and he was great. No problems. His technique was solid and I had no qualms. Interestingly there was another guide on the route (South East route on Nelion grade IV-). We shared about three pitches together before we drew away (he had two clients). His technique was very sloppy and I found many faults. I frequently thought that if this guy was trying to get a guiding permit in Europe he would have been failed many times. 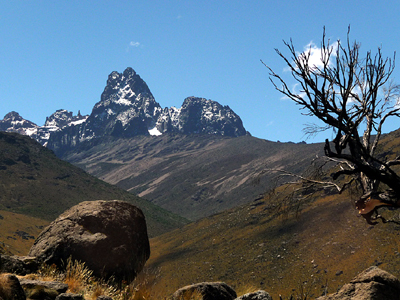 To find a climbing guide for Mt Kenya I enquired five companies. Only two bothered to respond 1) James Kariuki 2) Chris Mbogo. I thought it was pretty slack to not even bother responding to an enquiry email about their services. Join in and write your own page! It's easy to do. How? 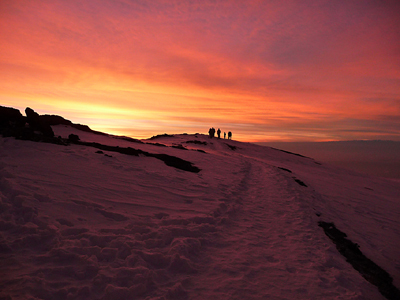 Simply click here to return to Kilimanjaro Climb.